Kollywood celebrities, includingï¿½director Vasanth, cinematographer and filmmaker Rajiv Menon and actor-writer Crazy Mohan will share the dais with State Minister Mr. Thangam Thennarasu in a short story award function organized by writer Sujatha Trust on March 7th. 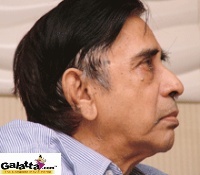 The awards function, which it to be held at Asha Nivas in Nungambakkam, Chennai, will felicitate the winner of a short story competition organised byï¿½Sujatha Trust inï¿½memory of eminent Tamil fiction and screenplay writer Sujatha (aka S. Rangarajan) in collaboration with Aazhi Publications. Writer Tamil Magan, whose short story has won the first prize, will be honoured at the function. Celebrities attending the event are expected to share their thoughts on the illustrious writer and their memorable moments with him. Sujathaï¿½penned several science fiction stories, short stories, novels and screenplays. A writer par excellence, he was the story or script writer behind many blockbuster movies of ace directors Shankar and Mani Ratnamï¿½and others.